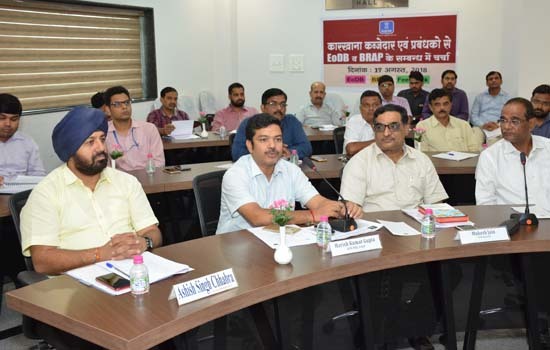 Udaipur: A workshop on "Business Reform Action Plan (BRAP) - 2018" theme was organized at the Pireotech Tempsons Auditorium of UCC Bhawan, jointly under, Udaipur Chamber of Commerce and Industry and Factory and Boilers Inspection Department. . Mr. Mukesh Jain, Chief Inspector, Factory & Boilers Inspection Department, Jaipur, was the Chief Guest and Mr. Harish Kumar Gupta, Senior Inspector of Factory and Boilers Inspection Department, Jaipur was the special guest of the program. This was the first workshop organized by the Factory and Boilers Inspection Department at "Business Reform Action Plan (BRAP) - 2018" in Rajasthan. At the beginning of the workshop, Mr. Ashish Singh Chhabda, Senior Vice President, UCCI in his welcome address.gave a brief overview of the activities &said that most government services and processes need to be done online to facilitate industry and trade. This workshop has been organized to generate awareness about the measures to facilitate the business by the central and state government in employers and managers of the industries. While conducting the program, Honorary General Secretary Mr. Kesar Ali said that UCCI is committed to facilitate trade facilitation and safety measures related to the sharing of factory and boiler department. While highlighting the rules related to the factory and boiler inspection department, how can they be reduced by the process of legal compliance, Mr. Kazaar Ali appealed the participants to avail the work from the workshop. Due to paperless process (paper less process), online single window system, online tax payment, contract enforcement (available for purchase of land), availability and allocation of land, obtaining electricity and water connections, support for transparency, taxes, labor regulation, construction Permits, Environmental Registration as well as online disputes for commercial dispute resolution and property registration, such as 'Easy Doing Business' Allowances are included for ranking states. Grant and renewal of licenses under the Factory Act have also been included.In addition to this, under the Factories Act, the approval, renewal and registration of licenses for the construction, expansion, planning and use of any building as a factory, registration and renewal of boilers, along with various laws Under compliance inspection has also been included. During the technical session, information was given through the slide shows on the issue regarding the Factory Safety Award Scheme and Numerical system by Mr. Mukesh Jain, Chief Inspector of Jaipur, Chief Guest Factory and Boilers Inspection Department, Jaipur. ShriMukesh Jain informed that these awards will be given through online applications based on the last three years of the industry data for the purpose of promoting accidents and prevention of safety measures in the factories. During the workshop senior inspector Mr. Harish Kumar Gupta gave information about the steps taken by the Department of Factories and Boilers Inspection Department under the "Business Reform Action Plan (BRAP) - 2018". Shri Harish Kumar Gupta said that all the information related to the department is available on the website. On the basis of 36 points, the Central Government was entrusted with the task of repair work, under which the amendments were made in the Factory Act 1948. The rules were also simplified in the Boilers Act. The state is ranked first in the improvement of labor laws, incentives for self-verified process, IT support system etc.Shri Gupta said that for the year 2017, on the basis of the assessment of implementation of 'Business Reforms Action Plan', Rajasthan has been ranked ninth in the top Achievers category in the state-wise ranking. This is the state government's efforts to improve the ranking of the state and bring it to fifth place. The point to benoted is that this ranking is not permanent. This is a dynamic ranking. Under this, it is natural to have a change due to the rapid competition between them in the states of the states.